There’s lots of scammers out there. Only sell locally, don’t mail anything unless you can be absolutely sure that you absolutely know and trust the buyer personally. When selling, make the buyer meet you and pay in cash. Meet in a public place that you as the seller dictates – do not meet at your home. Don’t accept any form of payment except for cash. This is debatable, but sticking to my guns on this has helped me a lot. If a buyer won’t talk to you on the phone, that is pretty suspicious. For that reason, it can help to only post your phone number on listings rather than an email address. immediately if you are selling to me. 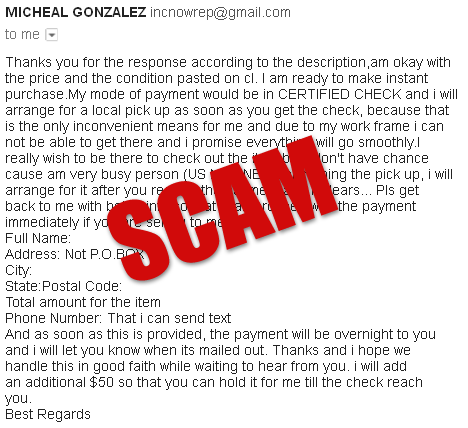 This was sent from some guy claiming to be named Micheal Gonzalez with an email address of incnowrep@gmail.com. I get one or more of these for nearly anything I post on Craiglist for sale that is worth over $100. When I first got messages like that, I would reply with only my phone number and tell them to call. They would never call. Then I wised up and now scam messages are pretty obvious. In addition, a bank will often cash the cashiers check initially but then soon after you will be contacted by the bank once the find out the check didn’t really clear and is a fake. If you’re going to sell on Craigslist, be careful, scammers are going after sellers as well as buyers. believe you will enjoy working with me..